Should Europe’s least-visited (and tiny!) country be your next healthy travel destination? Setting out to plan European getaway might conjure thoughts about popular hot spots—you know, the Eiffel Tower in Paris, the royals at Buckingham Palace in London, and the Colosseum in Rome. But sometimes, it’s fun (and rejuvenating!) to avoid the touristy destinations and instead travel off the beaten path. Heard of San Marino? It’s one of the smallest countries in the world at only 23.6 square miles, and it’s completely surrounded by north-central Italy—AKA a country within a country, or a micro-country, if you will. Take the well-known cable car for a dreamy bird’s-eye view of the sights, explore medieval villages on foot, and sip on fresh wine from local vineyards. 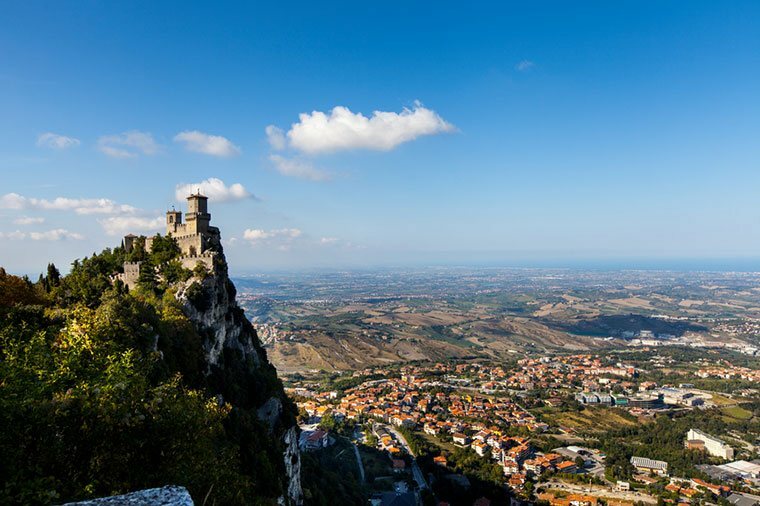 Despite being completely stunning with mountain views, castles (known as the Three Towers of San Marino), and all the homemade pasta made from fresh ingredients, you could ever want the tiny nation was named the least-visited country in Europe by the United Nations World Tourism Organization in 2016. And if it’s not on your current healthy-travel bucket list, there’s no day like today to amend that oversight. And after you visit this dreamy outdoor oasis (which could very well become a busy it-destination after wanderlusters become aware of it), check out the least-visited nation in the whole world. Tiny restorative respites could be your tiny travel niche. Add these healthy destinations to your 2018 bucket list immediately. Or, check out Airbnb’s 10 most-booked cities that are perfect for exploring.